We seem to have an abundance of Aussie pubs and Italian restaurants in good old Adelaide, but it’s not often you come across a good Lebanese cafe. 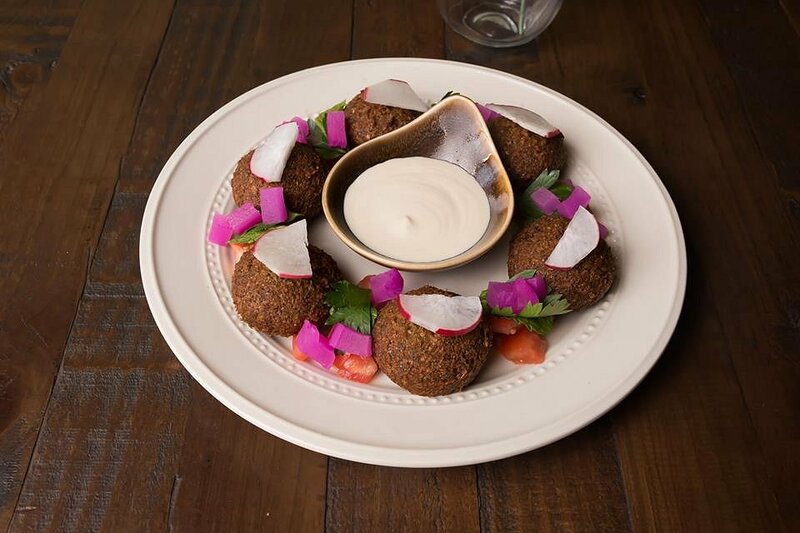 Having been open for just over a year now, The Rustic Fig Cafe aims to bring Adelaide some of the authenticity of Lebanese cuisine. Owners, Erica and Naji Rizk, moved to Australia from Lebanon and, having been mushroom farmers back home, knew they definitely wanted to follow the path of food in Adelaide. “Naji either likes to grow food or eat food. Grow it, cook it, and eat it,” says Erica. Though Naji originally wanted to call their new project The Fig and The Olive (as these are two primary ingredients in Lebanese cooking), Erica didn’t like it so the search continued for the perfect name. “Naji wanted the rustic vibe – to be sort of villagey. So we were just playing with ‘fig’ and ‘olive’ and ‘rustic’ and I said ‘what about The Rustic Fig?’. He said ‘I like it!’ so we put it in the search engine and it was available and we went ‘take it!’,” says Erica. Thus, The Rustic Fig Cafe was born and, true to its name, the interior features warm, homey colours, with oil paintings decorating the orange walls. The primary attraction is the brown brick wall that wraps around the barista bar which is reminiscent of a Lebanese village. So what exactly does The Rustic Fig Cafe have to offer? With colours representing the Lebanese flag, this dish features zaatar served on a freshly baked manoushi dough base, with a dollop of labneh (strained yoghurt), and topped with a sprinkling of diced tomato, olive and fresh mint. 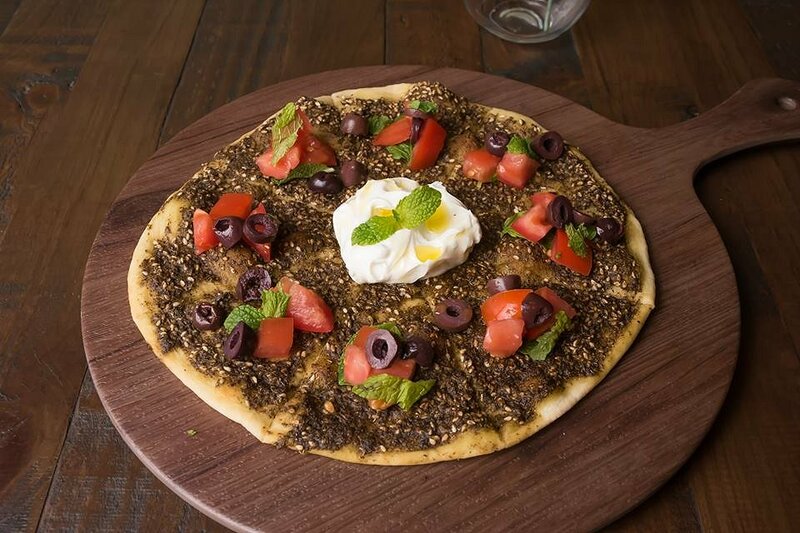 The dough base was soft and fluffy and the slight bitterness of the zaatar was complemented by the salty olives, acidic tomatoes and refreshing yoghurt and mint – a perfect way to start our meal! 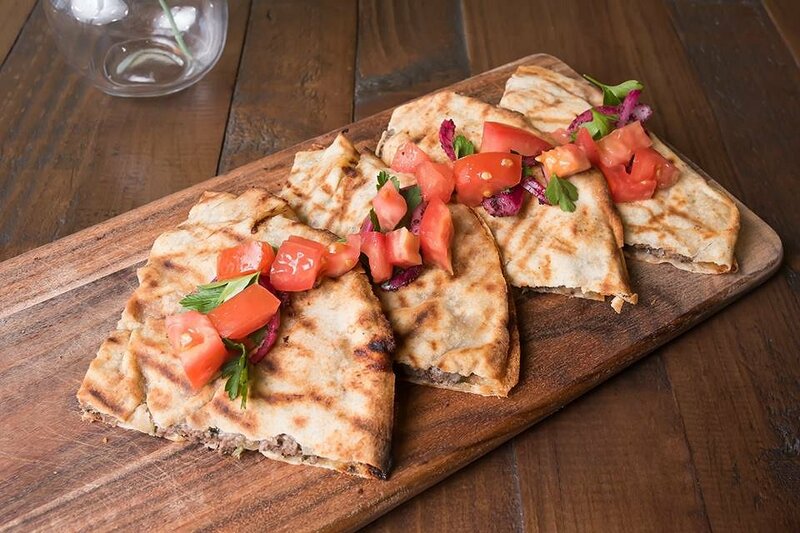 Kind of like a Mexican quesadilla, this dish featured minced lamb, well-seasoned with house seven-spice mix, parsley, and onion, grilled inside Lebanese flatbread and served with a yoghurt and mint sauce. The meat was generous and well-marinated so we couldn’t help but gobble down all four pieces in record speed! 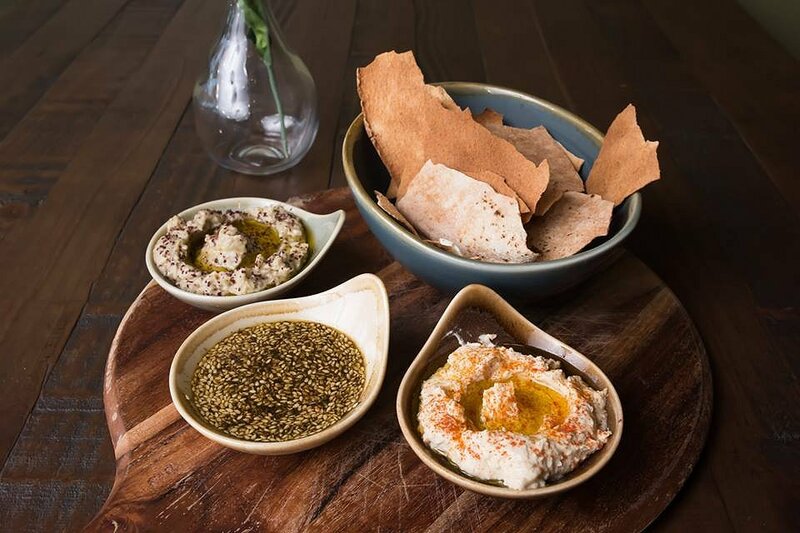 This dish had a total of three dips – hummus, baba ghanouj (eggplant) and zaatar with olive oil. The dips come served with baked Lebanese bread, which had good strength, carrying the heavy dips with ease. 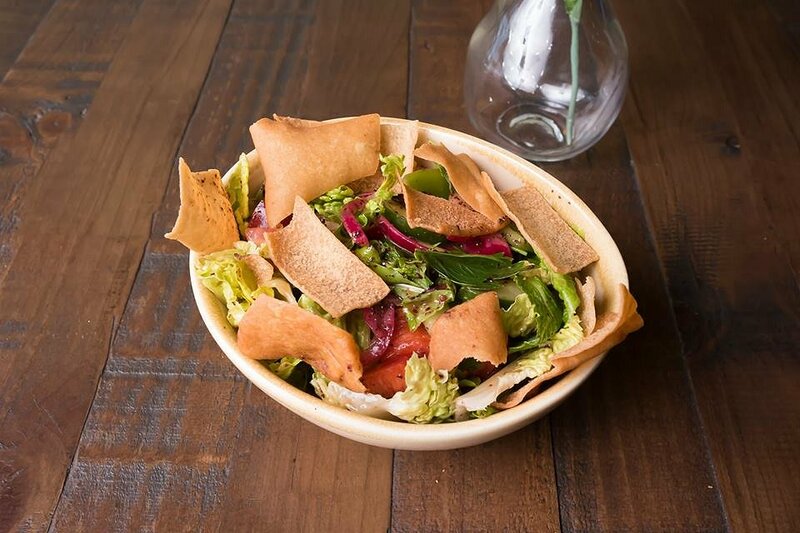 The surprising thing we found was that this Lebanese bread was actually bottomless, with staff happy to keep refilling until all the dips are gone – making this perfect for sharing! Lettuce, tomato, radish, cucumber, parsley, mint, capsicum, onion, and pomegranate molasses make up this classic salad. The unique thing about this one is that it is finished with pieces of deep fried Lebanese bread that somewhat remind us of healthy chips! Delicious! 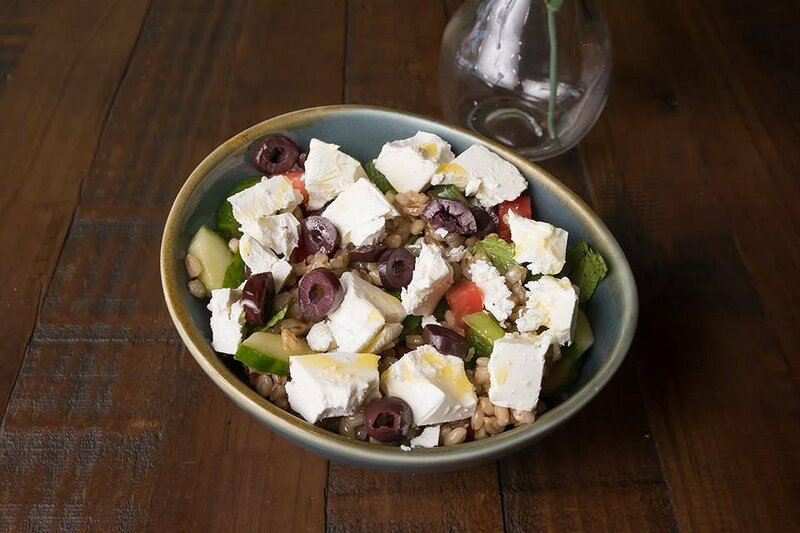 This salad is made primarily of pearl barley, mixed with tomato, capsicum, cucumber, olive, and crumbled feta. Although we initially looked past this salad’s description in comparison to the others, this ended up being our favourite of the day – being not only tasty, but incredibly filling too! 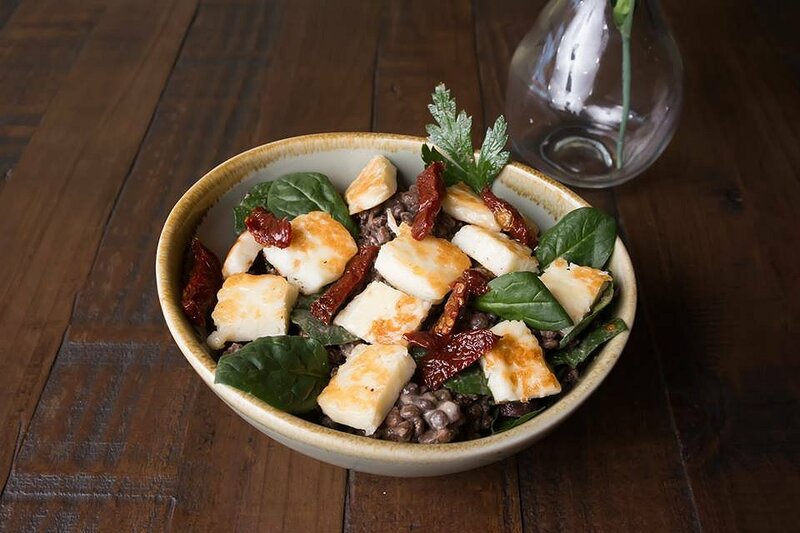 Already featuring black lentils, baby spinach, parsley, sundried tomatoes, red onion, and olives, we decided to add the optional haloumi to the mix (because who can go past haloumi?!). Like the Groovy Grains, this salad was also very filling, with the ratio of all the ingredients being absolutely perfect, creating a fantastic flavour profile! 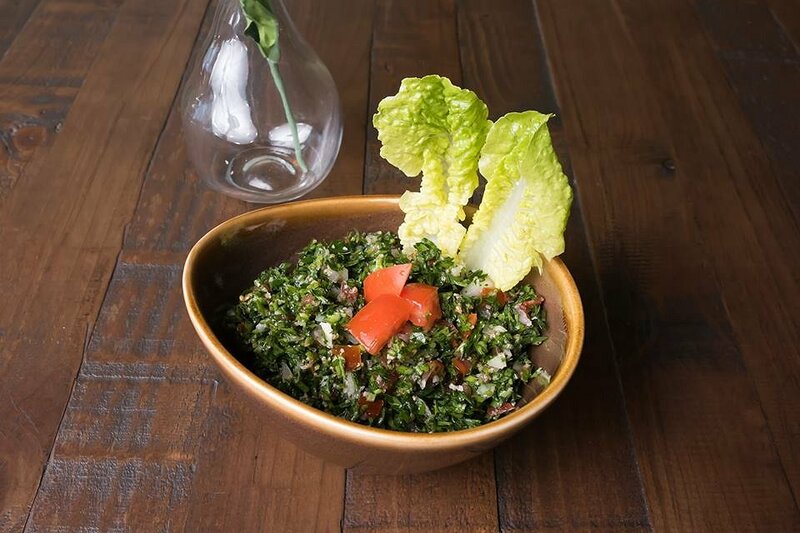 This traditional Lebanese dish heads back to its roots through Rustic Fig’s take, with the sea of green chopped parsley, diced tomato and onion dotted with flecks of bulgur, and not the other way around, like many Aussie versions of tabbouleh tend to do! This meant we had never had (authentic) tabbouleh quite like this one before and boy, was it bursting with flavour from the parsley! The Lebanese definitely do it right here! Not only was the food from our visit delicious, but we noticed that there was an amazingly heart-warming community vibe that surrounds The Rustic Fig Cafe. Even though they have only been open just over a year, Erica and Naji seem to have slotted right into the Erindale community, as we noticed the two greeted almost every person who walked through their doors with their names and a bright smile! With such a friendly and inviting atmosphere, who wouldn’t want to give this little cafe a go?! The Rustic Fig Cafe is open Monday-Thursday 8am-3:30pm and Friday-Saturday 8am-9pm, with a special banquet option available after 6pm Fridays and Saturdays.